Once you are done making this stock you also end up with a whole cooked chicken. Definitely don’t let that go to waste and plan something special like a chicken pasta dish, enchiladas, chicken fajitas, chicken salad, or even something like a chicken noodle soup recipe that utilizes both the stock and the chicken. The cooked chicken could also be frozen just like the stock. Combine the chicken and water in a large pot. Bring to a boil and then simmer gently for about 30 minutes. While it is simmering, occasionally skim off the impurities (whitish bubbly stuff that rises to the top) with a slotted spoon. Next add the chopped onion, carrot, celery and bouquet garni to the pot. Simmer for 3 hours uncovered, adding water as needed to cover the chicken. Strain stock through fine mesh or cheese cloth before storing in fridge or freezer. When ready to use remove the white layer of fat off the top. Also when cooking with the stock don’t forget that this version has far less salt/sodium than the typical canned variety, so you may need to season to taste. 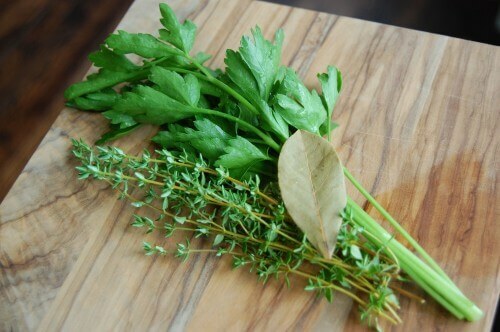 A bouquet garni is comprised of - a small bunch of parsley, 8 sprigs fresh thyme, 1 bay leaf, and 2 or 3 celery leaves. It's tied together with cheese cloth or cotton twine. Hi there! I’m SO enjoying your posts here and especially on the 100 Days blog. Your family is amazing and inspiring! I just have a totally random question… What do you freeze your foods in? I’m new to giving up on processed foods and I realize I’ll be doing a LOT more “from scratch” cooking, which will result in freezing lots of stuff to keep on hand for use as needed. I’ve tried freezer ziploc bags but the food inevitably ends up with ice crystals all over it, even after just a few days. As for soups, sauces, etc… is it safe to freeze in tupperware? I’m curious what you do. I want to be sure whatever method I use is safe (no chemicals leeching into the food) and effective (doesn’t result in freezer burn). So sorry for the long comment/question! Thanks for your comment! I actually use tupperwear (ziplock brand I think) for just about everything in my freezer, and I have not had any issues like you mentioned. If you are using the freezer zip lock bags and still getting freezer burn you may want to try double-bagging items first (and also make sure you get as much air out of the bag as possible). In addition, you may want to double-check that your freezer is set to the right temperature if you continue to have problems. I was just wondering, does the chicken actually taste good after boiling that long? It would seem like it would be really chewy or tough…. Yes! It is actually really good and tender just as if you slowly cooked it all afternoon in a croc pot/slow cooker. 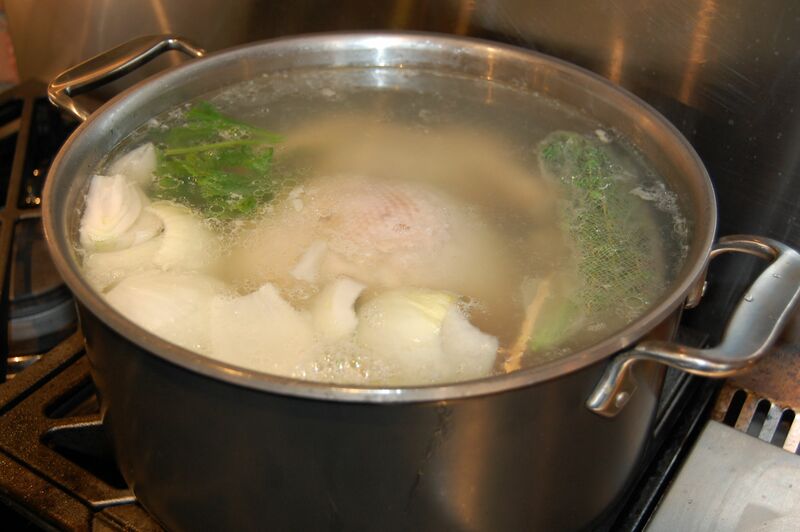 Another great way to make chicken stock is to roast the chicken first and enjoy the meat when it hasn’t been boiled. Then make chicken stock with the bones, skin, and bits nobody wants to eat. If you do it this way, you can add your veggies right at the start. We don’t usually boil for more than an hour or two because we are lazy, but it’s still plenty tasty. Also because we are lazy, we just strain this in a sieve. The yield is less, but it’s also less work. @Kathy: we freeze in pyrex glass or in mason jars. As long as there isn’t too much air in the container and you don’t keep it too long in the freezer, there’s little to no risk of freezer burn. I started doing this because I can only imagine the types of chicken they use to produce conventional broths…I haven’t researched but I’m thinking it may really gross me out! I actualy make vegetable stock more often from the veggie scraps I have leftover and freeze it…way cheaper and I know exactly what is in it. Do you mind me asking where and what type of chikcen you guys purchase? I have a hard time cooking whole chickens. I get our chickens either from the farmers market or through our CSA membership (one of their partner farms). Either way it is locally raised. But no matter where I get it from my husband always has to deal with the skin and whatever may be stored inside for me…I don’t like that part! We do the same thing with out veggies. I have a freezer bag full of scraps and keep adding to it and at the end of the month have a great big bag for making stock. I also do this with meat scraps and left over pieces of meat. I was taught that if you use chicken meat to make stock you throw the meat out after boiling. The meat is what flavors your stock, so leftover meat is flavorless. In the interest of not being wasteful, I have never used a chicken with meat to make my stock; instead I use a carcass from a roasted chicken which we already enjoyed. I read your comment about the meat being tender. Have you found it flavorless as well? Have you eaten it on its own, or is it always part of a dish? I’m kind of obsessed w/wastefulness, so I’m very interested in your opinion. We actually think it tastes pretty good right out of the pot although we do usually add it to a dish that already has some flavor on its own (like a pasta dish, quesadillas, a soup, etc.). I have just always made the stock with a whole chicken that I serve afterwards and I have never heard a complaint about it! I’m with Rachel and Fiona. I roast the chicken first and then boil the carcass. This also lets you break the bones and get the marrow in there and your stock will gel. It’ll be so flavourful you’ll have to water it down! I’ve also found adding some sea salt tends to bring the flavors out of the veggies, chicken and herbs more. You don’t have to put much in, but for me it helps. I’ve recently started making it with the carcass as well and it definitely does the trick. Thanks! This may be a stupid question, but it there a difference in the amount of water used depending on if you use a whole chicken vs carcass? I just made a stock out of a carcass and used about 10 cups of water in a crock pot (partially bc I didn’t have a whole chicken and partially bc my crock pot is not that big). It yielded about 8 cups of broth after cooking for 6 hours. Can I use 16 cups of water with a carcass if a use a regular pot or do I have to use less water to get the flavor? I need to get as much stock out of each chicken as possible. I LOVE soup and ’tis the season!! I haven’t experimented to that level of detail, but I do know the less water you use the richer the stock will be and vice versa. It will still be “stock” no matter what…but I’ve learned that not all stock is created equal! I just tried the “whole chicken in the crock pot” and am using the bones to make stock. I was wondering if you keep the juices and onions from the chicken and add the bones, veggies and water back to what is left in the crock pot or do you start all over? Shoot…I just read on the other page that you do leave everything in. I started over and didn’t have alot of bones in the bottom of the pot…am I going to have a very weak stock? This is my first time and as I was getting rid of the leftover veggies and juices I was thinking it would’ve been good to keep it. What are my options if it’s weak? I was looking forward to some chicken noodle soup! Don’t worry…no two batches of stock are exactly the same. You could still use it to boil rice or something like that. I might be a little late answering you, but yes you leave everything (including juices, onion, bones) in crock pot when you add the other stuff to make the stock. As someone mentioned above, keep a baggie in your freezer for veggie scraps – carrot, onion, and celery ends, as wel as garlic, shallots, herbs that won’t be used in time. Then just toss that in instead of using a perfectly good whole veggie! I have made the chicken stock twice (both from the whole chicken in a crockpot recipe) and have struck out twice. The first time, after cooking the chicken, I dumped everything out and then put the carcass back in with water and veggies. Came out super “blah”. So I read these comments and made it last night with keeping all of the juices and onions, etc…and it came out so oily and greasy we had to through it out. I don’t want to give up on this recipe but am not sure what to do differently next time. Amy – If you thought the second batch was too oily all you need to do is refrigerate the stock then the oil/fat will rise to the top and become a solid layer that you can scrape off if you want. There’s definitely fat that comes from cooking a whole chicken and all its parts, but it’s okay to use/eat the fat…it’s just personal preference at that point. Thanks for the tip Lisa, will try that next time! This is the first time I am doing a whole chix in crockpot and have a question in regards to your reply to Amy’s question about the stock and the fattiness of whats left over after cooking. After I remove the chix from the crockpot should I just put the pot in the fridge overnite prior to making the stock(to remove oil and fats) and then commence with the making of the stock? OR make the stock then refrigerate , remove fats the next day and then freeze? Removing the fat is optional and would be easier after it chills. OK I put leftover chicken fluids in fridge over nite. the next day I had a thin layer of yellow fat on top and then was presented with a large bowl of chicken JELLO (for the best description) nuked it back to a liquid base and added 3 cups of water. today I have a bowl of chicken jelly. not as thick as yesterday. My intentions are to make a chicken soup. Just how do I fix this into a stock????? You could try adding water. I know this is old, but maybe it will help someone else. “Chicken Jello” is good, sign of a healthy chicken from what I have read. I believe it will turn to liquid when heated up in your soup. This may be a dumb question but I am new to all this –including cooking in general LOL– I want to start making my own stock and putting in jars to freeze. What would the recommended size be to freeze — a cup? two cups? What is typically used in cooking? Not a dumb question at all! First of all make sure you use freezer-safe jars. Secondly when you buy a can of chicken broth it’s just under 2 cups so that might be a good place to start. I also freeze a little stock in ice cube trays (then transfer the cubes to a zip lock bag) in case I just need a little. I find that freezing the stock in different amounts can help in case you need a lot for risotto or just a little for some soup. Good luck! How do you determine if a glass jar is freezer safe? I’ve been reusing old spaghetti jars for my chicken broth and soup. And what happens if it’s not freezer safe? Late to the question, but if the neck is much narrower than the rest of the container, you probably should not use it for freezing. It’s when the liquid freezes and expands but runs into the narrowing of the neck that most of the breakage occurs. Here is my question. Hubby and I work full time so only get to really do major cooking on the weekends. We are saving in the freezer veggies to stockpile for stock. If we have a chicken during the week, and wont be able to make the stock for a week or more, is it okay to freeze the carcass so I can just make stock when I have more time? I think that should work, but admit I have not tried it myself. I know for a fact you can freeze seafood shells (from lobster or crab) to make stock later so I don’t see why this wouldn’t work with chicken. Yes, you can freeze them to make your stock later. I do this often, as I generally cook just a few pieces of chicken at a time. I’m going to do the 10 day challenge and hopefully will continue, but as a college student who will be moving back on campus next semester there are somethings that I won’t be able to do, are there any brands of chicken broth that can be purchased, like kitchen basics, or pacific foods my mom has to buy these because she has a gluten allergy or stock-in-a-box? I am not sure which ones are gluten-free, but I would definitely go for an organic chicken broth if you can! The bones are actually far more important to make a good stock than the meat is. You could try making a vegetable stock, though — no bones there! What about making vegetable stock? Is there a recipe or link on Lisa’s page for a similar recipe? I thought I had seen one before. I am searching around, but unable to find anything. this is the recipe i use for veggie stock…hope it helps! making my 2nd batch of chicken stock tonight, hope its as good as the 1st batch I made, LOVE your site Lisa! I wanted to comment on the chicken stock. In order to get the maximum nutrition of the bones, the bone building marrow, this is what I do. I roast the chicken, and when we have picked off all the meat, I take the skin, bones and junk leftover and put into the crock pot with whole onion cut into fourths (skin included, that is where the vitamins are), couple carrots and celery stalks chopped into 4 in pieces, 3-4 freshly pressed garlic (pampered chef is best because you dont have to peel it first, just press and them pluck out the empty skin), fresh shaved ginger, and a tad of salt and pepper. Cook on low for 12-14 hours, then pull out vegies, and throw away, pull out all chicken parts into sep bowl, strain broth into a jug and put in frig, then dump all the chicken parts into the crock pot again and add all new vegies. Do this whole process 3 times total. On the 3rd time, combine all the broths together in a large pot and reheat in order for the final and best marrow extracted from last batch to be mixed in with all the broth, and the most flavorful broth will be from first. This way all broth tastes best. Then I can it so it wont take room in the freezer. This whole batch gives me about 7 quarts of broth, plus enough to make soup with for supper that night. Simmering bones for a few hours will not give you the maximum benefits from the bones…in fact, the last time you simmer in crock on low, you can do it for about 15-18 hours if need to…I find that after supper first night and through night is first batch, then all day the next for 2nd batch, then over night for 3rd batch, and then I have plenty of time to can the broth that second day. Its super flavorful and I will never buy store bought again! I made this tonight, it was my first time homemaking my own and it turned out wonderfully! I now have enough cooked shredded chicken for 2 meals and 4 quarts of homemade broth! I just used this recipe to make stock from the carcass (and a little extra meat) from our Thanksgiving turkey. It was a turkey from a local farm that grazed outside and had a happy life. I hated to not use every last bit so I decided it was finally time to make my own stock. It always intimidated me but it couldn’t have been easier!!! I didn’t have dried herbs but since it was well seasoned from roasting I think it will be fine. It’s so healthy and a good way to respect the bird and not be wasteful. I learned a very frugal way to make this same recipe in culinary school. I love it because it utilizes the parts of food that would ultimately go into the compost, the food scraps. Whenever I peel carrots or an onion, I save the scraps in separate ziplocs in the the freezer, the same for celery trimmings and chicken or other animal bones. I also save all of the stems from fresh herbs: parsely, thyme, sage, etc, the stems have flavor too! I usually butterfly my chickens before roasting them and to do that I have to cut the backbone out, so into the chicken scraps bag it goes! I also save roasted chicken bones too, they add a complexity to the stock. Then, when my freezer supply is down I pull out both crockpots and add the “scraps,” cover with water, and simmer overnight, in the morning the house smells wonderful and I have quarts of stock ready to be strained and stored in the freezer. I usually use a small amount of animal compared to 100dorf’s recipe, just a handful of bones or parts adds all the flavor I need. My grandma always added a couple of splashes of vinegar to her stock to pull calcium from the bones. Is there a reason you don’t do that? I was getting ready to make this & just wondered. Thank you. Can I use this method to make stock, pull all the meat and make stock again with the carcass? Will the second time around be ‘weak’ stock? Thanks! Is there another option of making homemade chicken stock that requires a shorter period of time of cooking? A pressure cooker is great for making stock! They’re fairly inexpensive, too. Just check out your user’s manual or a reputable website for specific directions. How long will this stock be good for in the freeze? I have some that is a little over 6 months old and I’m not sure if it’s still safe to eat..thanks!! Love this recipe! Hello. I know that making your own chicken stock is preferred but if you’re in a pinch and need to buy some at the store, which brands pass the rule test? I normally shop at Trader Joe’s, but can also make it to a Mariano’s or Whole Foods. Thanks! This website has been so helpful in my lifestyle transformation! I wonder, could this chicken stock be home canned instead of frozen? Hi Kimberly. I’m sure it can be canned but it is not something we’ve tried. Here is a blogger who has: http://www.theprairiehomestead.com/2012/12/how-to-can-homemade-stock-or-broth.html. How long would this stock be good for in the fridge? A week? Hi Melissa. If you want to keep it beyond 4 days you should freeze it. The last few times I have tried to freeze this in Mason jars, the jars have shattered in the freezer, even after allowing it to completely cooling and leaving room at the top of the jar (only filling about 3/4). I have also tried gallon ziplock freezer bags but have had issues with the seams cracking or bags leaking when thawed. Either way, I end up losing/wasting the stock that I wanted so badly. Anyone else have this experience or any ideas what else I can try? Hi Megan. Are you using freezer safe, wide mouthed jars? It is important that you do not use jars with a shoulder. Has come out great everytime ! Added a few whole cloves of garlic.